A high school romantic comedy and drama, Love, Simon finds sensitive humour and humanity in the story of a young gay man struggling with coming out. 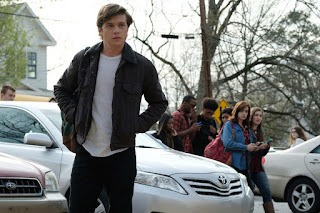 In a suburb of Atlanta, Simon Spier (Nick Robinson) is a well-adjusted teenager from a middle class family in his final year of high school. He gets along well with his hip parents Emily and Jack (Jennifer Garner and Josh Duhamel) and his younger sister Nora (Talitha Bateman). Simon's one big secret is that he is gay, and worried about the consequences, he is unsure when and how to come out, or whether he even should. His best friend of many years is Leah (Katherine Langford), and his other good friends include soccer player Nick (Jorge Lendeborg Jr.), who is interested in Abby (Alexandra Shipp), the new girl at school. Martin (Logan Miller) is an obnoxious classmate lusting after Abby. Under the alias Jacques, Simon anonymously enters into an email exchange with someone using the pseudonym Blue, an unknown schoolmate who reveals himself to be gay. The correspondence blossoms into a digital romance, with Simon ever more desperate to find out who Blue is. But Martin stumbles onto the emails, and attempts to blackmail Simon into helping him connect with Abby. 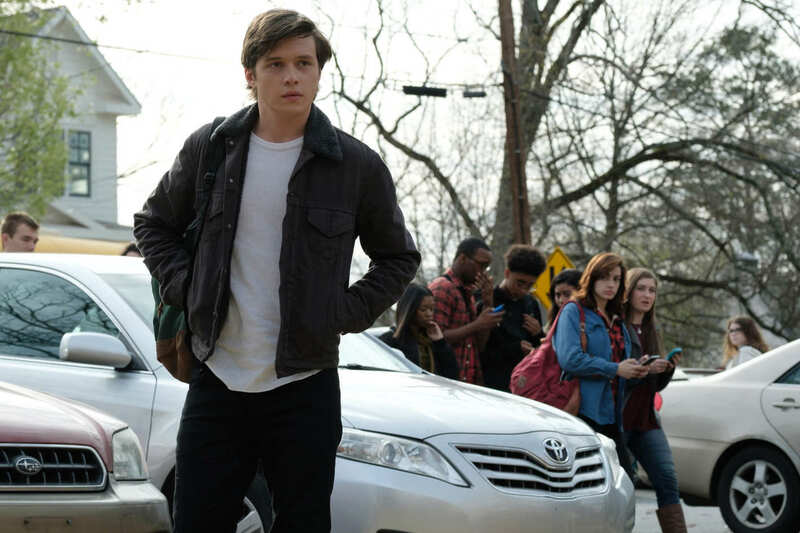 Directed by Greg Berlanti, Love, Simon succeeds at what appeared almost impossible: breathe a burst of refreshing new life into two long moribund sub-genres, the high school comedy and the rom-com. 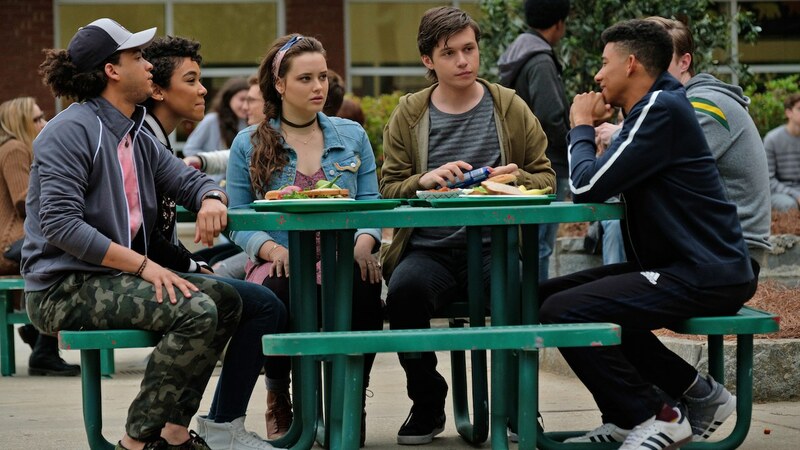 And Love, Simon achieves its success by embracing smart kids, delving into the world of true friendships, and steering well clear of bro-level stupid gags and body fluid jokes. Rather than being celebrated, the annoying classmates here are the annoying classmates, destined to make life miserable for others but mostly for themselves. The core of the film deals with the strain of announcing sexual identity, and despite falling in love with the elusive Blue, Simon finds it exceptionally difficult to gather up the necessary courage. His coming out predicament lands in the middle of a loving family and an exceptionally close-knit group of friends. And if a guy like Simon finds the idea of revealing he is gay terrifying, society still has a long way to go to welcome diversity in all its forms. The humour is nuanced and stems from the situations. Simon and his friends are involved in putting on a school play production of Cabaret, and their drama teacher Ms. Albright (Natasha Rothwell) has to tolerate the talent limitations at her disposal. Vice Principal Mr. Worth (Tony Hale) patrols the hallways clumsily trying to bridge the generational gap. And Simon's sister Nora is into a cooking phase, subjecting the family to daily culinary experiments. And when it's time for honest and serious conversations the film delivers, a stirring and difficult scene between Simon and his mother hitting exactly the right tone of parental love. The romance elements are unique and timely. Simon falling in love with an emailer affords Berlanti the opportunity to playfully bring to life imagined scenarios, as various guys at school occupy Simon's mind as potential Blue candidates. The film wraps an intriguing mystery into its mix, challenging the audience to play along and spot who may be the gay lover-to-be from among Simon's acquaintances. The impossibility of the task is exactly the film's point: we are all different, and all the same.